Tech Contracts Academy’s forms library provides sample clauses—including all the examples in The Tech Contracts Handbook — and full-length tech contract forms. 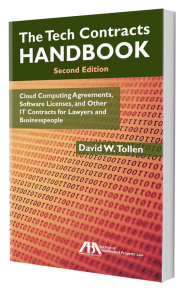 Click on Contracts below for the full-length contracts and on Clauses, also below, for sample clauses. Click below for full-length IT contract forms, in MS Word. Click below for sample tech contract terms, available for copying and pasting.